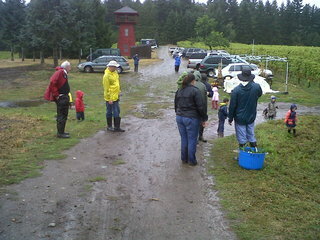 Farmer Karen Selvar and volunteers bring in the (wet) corn harvest..
On September 26, children barked and dogs frolicked as we harvested corn in the rain for the Bainbridge Island School District. This is the second year that local food has been provided through EduCulture to the public schools. It took less than an hour to harvest 600 ears of corn that will be served later this week. will be shucked by student volunteers in the school kitchens at Sakai, Woodward, and the High School the following day. Bainbridge Island corn will be freshly featured in the BISD school lunch menu on September 28 as part of Taste Washington Day! Food grown on the island will be featured monthly in the BISD school lunch program throughout the school year. Akio Suyematsu’s raspberries from Day Road Farms were purchased by BISD and will be served with a granola and yogurt menu item. Potatoes planted and harvested by elementary students at Wilkes and Blakely at the EduCulture Project’s edible education plots at Morales and Heyday Farms will also be featured lunch items.